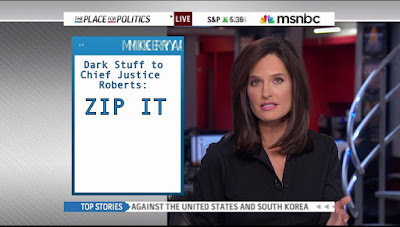 While I was out sick, Supreme Court Chief Justice John Roberts made the news a couple of times. It's rare that the Court makes the news for anything other than a big decision or a death, so I took note. The first story was a bogus rumor that Roberts was stepping down from the Court. This seemed implausible because he has only been on the bench a few years, is relatively young, and has no known health problems (except, of course, for the epilepsy that was not disclosed in his confirmation). The story was retracted after a few hours. The second involved the ridiculous attacks on President Obama that came from Roberts while speaking to law students at the University of Alabama. The Chief Justice found it "very troubling" that the president dared to disagree with the almighty John Roberts during this year's State of the Union speech. The president voiced his disagreement with the Court on the Citizens United campaign finance case. You know, the one that virtually guaranteed that all future elections in the US will be 100% corporate funded (because, after all, corporations are more important than people). Roberts then questioned why the Supreme Court even needed to show up to the SOTU because according to him, it has "degenerated to a political pep rally." Interesting how it becomes a "pep rally" as soon as his side no longer controls the White House. Mr. Roberts comments are ridiculous in a number of ways. First, since becoming Chief Justice in 2005, Mr. Roberts has repeatedly violated his pledge not to introduce politics into court decisions. In his conformation hearings, Roberts claimed his role would be that of an umpire in baseball - just calling balls and strikes. That is just not true. Roberts has been moving the court in a radical way to the extreme right. Decisions like the Citizen United case show that the Roberts court will ignore hundreds of years of precedent and law to arrive at its pre-determined, corporatist, political decision. Roberts has used the Court to roll back civil rights for women, gays, and minorities. And he also fucked up President Obama's swearing in as president because he couldn't even handle the simplest of his required tasks. Perhaps, Mr. Roberts should try being an impartial "umpire" and not a driving force behind the conservative agenda, and then his comments on the political nature of a State of the Union speech would not seem so off base. And if his delicate sensibilities won't allow him to hear three seconds of criticism from an equal branch of government in a constitutionally mandated speech, then maybe he chose the wrong line of work. So if President Obama can make critical remarks of the SCOTUS in a nationally televised state of the union, why cannot the head of a co-equal branch of government also state a criticism of the executive branch in public, Dave? Further, I reject your premise of Roberts intentionally moving the court to the right politically. He may have done so by removing the left of center tilt that Sandra Day O'Connor's retirement alleviated. Other than that, please give me examples of how Roberts has managed to "roll back civil rights for women, gays, and minorities." He can be critical of the president if he wants to, but I felt his comments seemed partisan and whiny, and not substantive. If he thinks its so unseemly to be criticized by the president, than why did he use his first public appearance since the SOTU to criticize the president? President Obama has not said the Court cannot be critical of him, yet it seems like Roberts is saying he can't be critical of the court. I think Robert's was saying that the state of the union speech was not the proper venue for the President to state an opinion on the outcome of a case because of Obama's political leanings on the topic. If you can't take the heat Justice Roberts, get out of the kitchen!